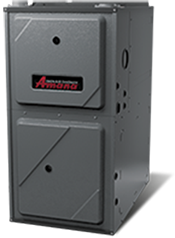 Product Description : Simply stated, we consider the AMVM97 modulating gas furnace to be our best. This gas furnace has an AFUE rating of up to 97%, which means that up to 97 cents of every $1.00 of heating energy expense warms your home. If the heat exchanger in this gas furnace ever fails for the original, registered homeowner, we will provide a new furnace at no cost. This furnace also has a 10-Year Parts Limited Warranty on all functional parts.